Hidro Santa Cruz over The Q’ambalam River. Rocael is Q’anjob’al Maya. He lives in Cantón Recreo B, in the Guatemalan highland town of Santa Cruz Barillas, Huehuetenango. He is married and has one daughter. He is 20 years old and studying to be a teacher. And for the first time in his life, on May 1, 2012, he understood the fear that his grandparents felt during Guatemala’s civil war. He related this to the reporter during a recent interview. Rocael was speaking about an event last spring in which an opponent to the building of a hydroelectric power facility and dam near his community was gunned down as he walked home from a fair in the town square. The man, Andrés Francisco Miguel, was killed and two of his friends were badly injured as they made their way home that evening. The murdered man had, for years, resisted selling his land to Hidralia Energía, the Spanish Corporation building the hydroelectric facility. In the days that followed Andrés Francisco Miguel’s murder, the local community rose in protest of the project and the lack of justice for their fallen campesino. For Rocael, he was finally able to contextualize the fear often spoken of by his grandparents, when they discussed the nation’s long and bloody internal conflict. 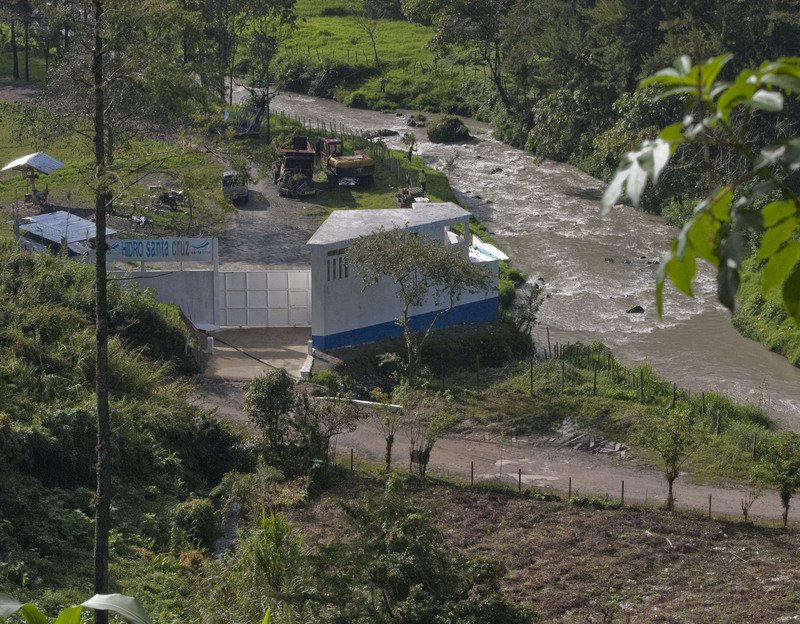 Old strategies of repression against small communities are repeating themselves in this region of Guatemala, where, since 2007, the Q’anjob’al indigenous communities have organized to defend their territory against the imposition of a foreign-funded megaproject. On May 1, last year, the people of Barillas were celebrating the annual festival in honor of Santa Cruz, their town’s patron saint. Along with Rocael, Cesar Juan, a Barillas community spokesperson, told this reporter how everything was proceeding normally with the annual event, until people heard the gunshots and soon discover that Andrés Francisco Miguel had been assassinated. This story begins in 2007, when a hydroelectric dam project, paid for with Spanish capital, began construction along the Q’ambalam River near Santa Cruz Barillas. 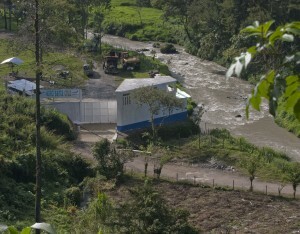 The company doing the work was Hidro Santa Cruz, the Guatemalan partner of Hidralia Energía, the Spanish transnational. Deeply unsure of the effects of the project on their lives, the Barillas community began organizing to defend its territory and oppose the megaproject. They did this by carrying out informational sessions with neighboring towns, holding community consultations and assemblies, meeting with municipal authorities, resisting the sale of their lands, demonstrating peacefully and holding a consulta, or public referendum, that came out strongly against the dam project. The situation had been tense between the community and the company, but it was the murder of Andrés Francisco Miguel on May 1 that set off a chain of rapidly accelerating events. On May 3, 2012, the Guatemalan President Otto Perez Molina declared martial law, asserting that the community had seized military weapons from an army base in the region in response to what was widely seen as the assassination of a community leader. The imposition of martial law led to the suspension of constitutional rights in Barillas — including the right to freely assemble. The President justified the imposition of martial law based on claims that community leaders had ties to the drug-trafficking organizations and terrorism. At the end of January 2013, this writer traveled from the city of Huehuetango — capital of the departamento of the same name — to Santa Cruz Barillas with organizers of an indigenous movement against this megaproject. My objective was to try and understand the government’s strategy of repression and the business interests that lay behind the dam project. During our days in the region, we were able to visit some of the affected areas, speak with neighbors — men, women, elders, youth and community organizers — as well as with the lawyer representing the Barillas community’s case. That day, Rocael fled to the mountains out of fear. He took his pregnant mother with him. He was afraid not only of assassins, but of being rounded up by the Perez Molina government under the orders of martial law. Other leaders, along with their families, fled for the border with Mexico. Rocael, frightened though he is, has returned to Barillas in order to keep defending his community’s territory. The buying up of indigenous lands, the persecution of leaders, the accusations of drug trafficking and terrorismo all became strategies of the government and the company in attempts to divide the community and undermine the movement against building the hydroelectric facility.